Macaggi 21 is one of the last born structures of the brand LE CASE DELLA STE that born here in Genoa now has facilities in Rome, Florence, Prague. We have treasured our experience and MACAGGI 21 is now a place where young and old all over the world find hospitality. In the true spirit of the hostel we have created 4 dormitories (but we have guaranteed privacy and security) and a double room. 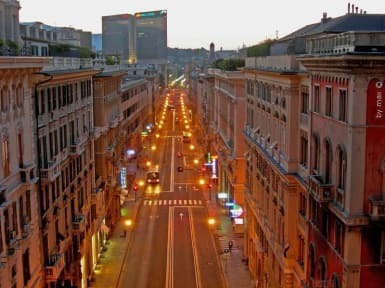 It is located a short walk from the center of Genoa, the Brignole Station, the Old Port, the Aquarium, Palazzo Ducale and the historic center of Genoa. Taxes of the city tax is not included. 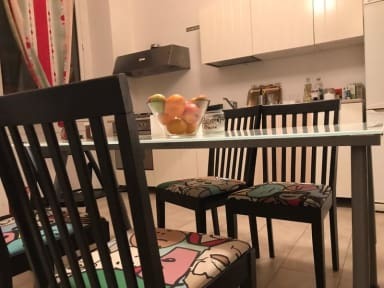 Apartment is spacious, nice and clean. Good location as well. Around 10 min walk to a busstop. Property Owners are sweet. It’s just that we had a problem with the shower. Water from the shower is either too hot or too cold, which they can fix it probably. Very friendly staff. Kitchen facilities were camping stoves in a large kitchen, but it had a great atmosphere and lots of space. Would recommend. The hostel has relocated, which caused much trouble on arrival at the reservation address and hopefully this has since been updated. The new hostel is still being set up, so the only working tap was in the communal bathroom, sockets are out of the wall in the kitchen and one day there was no running water at all, resulting in an unflushable toilet. They were busy on this and once the kitchen tap has been connected, the separate toilet made usable and the kitchen wiring sorted; it'll be fine! People don´t reserve this hostel plz. Look at the location of hostel its nonsense. when I got there i couldnt find the hostel so I called and asked where there is. But some guy took the phone and he said there´s no room today. I embrassed so I asked check the reserve again. But he just took off the call. So I called again and again but he never responded. Soon the boss of hostel called to me and there was mistake. So I requested refund but he also took off the call and never calling me again.